Aleppo: The Syrian army’s advance into rebel-held east Aleppo has deprived families of anywhere to hide and left shredded bodies of men, women and children strewn in the streets. Previously, civilians in the eastern sector of the city could try to take shelter from air strikes inside buildings, but now sudden artillery fire can pound the streets without warning, mowing down all those in its path. “It’s really raining shells,” said the AFP correspondent in the battered city. On Wednesday, the correspondent witnessed a shell crashing onto a main road, ripping off a little girl’s hand and piercing her head with shrapnel. With east Aleppo’s ambulances either destroyed or lacking fuel, no rescue services were available. Two young men on a moped tried to whisk 10-year-old Mona away to safety, but her family later told AFP that she died of her serious injuries. Two weeks into the all-out assault and after a months-long siege, pro-government forces have seized control of around 40 per cent of what had been rebel-controlled east Aleppo since 2014. After wave after wave of air strikes, the army is pounding rebel areas with intensive bombardment. The crude barrel bombs dropped by helicopters at least gave those on the ground a chance to take cover once the aircraft were sighted. The relentless artillery barrage has punched gaping holes in the walls of the apartment buildings still standing and torn down balconies. The UN’s World Food Programme spokeswoman Bettina Luescher on Wednesday described the plight of civilians in east Aleppo as a “slow motion descent into hell”. Many civilians in the stricken areas, especially Shaar district, have been left with no escape route to government-controlled parts of Aleppo. “The shelling doesn’t stop. It’s impossible to cross,” said one group trying to flee with their few possessions. 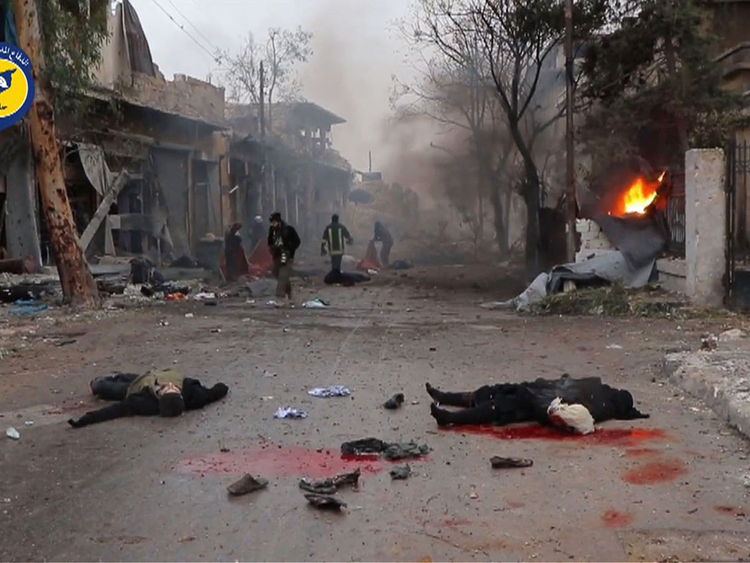 Videos posted online Wednesday by Syrian Civil Defence rescue group and the opposition Aleppo Media Centre show a blood-soaked street filled with corpses, human body parts and shoes. A teenage boy appears, crying next to two bodies, one of them his mother who had been walking a few paces behind when the shell struck. “The artillery hit a first time and we ran. That’s when I saw my mother was dead,” he says to the camera. The teenager had been with his parents and a group of displaced persons seeking shelter in a government-controlled neighbourhood of the divided city. “We’re leaving because of the injustice, the air strikes, the bombardments, the lack of food,” says the distressed father, as the bodies are wrapped in orange plastic. More than 50,000 terrified civilians have fled rebel-held areas in four days. According to the Syrian Observatory for Human Rights monitor, the battle launched on November 15 has killed more than 300 civilians in east Aleppo, including 33 children.